As a Housing Finance Authority, you have significant responsibility in helping affordable housing deliver on its core mission. The challenges of HFAs to manage the volume of tax credit applications, adhere to strict compliance regulations and manage a wide variety of internal and external project participants is massive. Procorem HFA software is the first of its kind to help manage documents, project communication, tasks and affordable housing compliance in a single application. With Procorem speed up the review of documents, tack all compliance data for a complete audit history and move away from manual processes to perform better customer services and a higher impact for affordable housing. With Procorem HFA software you can manage the intake of LIHTC applications completely electronically. Don’t worry about storing and maintaining physical 3 ring binders as all your data is saved and auditable within the Procorem application! Procrem’s open API allows you to easily integrate the system with your existing HFA compliance software, property management software and more. For a complete solution, Procorem integrate with ProLink HFA to provide a single system for all your HFA needs! With Procorem HFA software, you can open up the portal to external parties such as LIHTC award recipients. 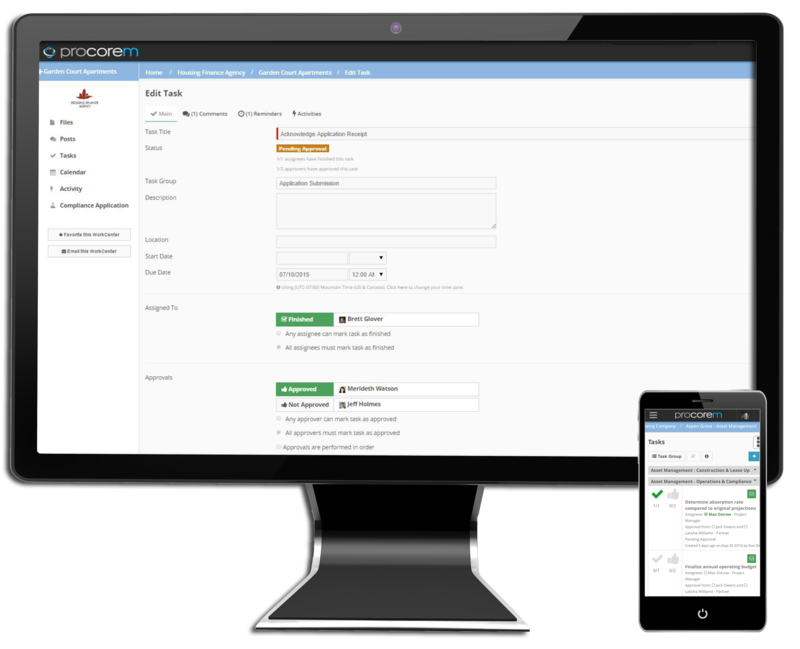 Easily manage the submission of tenant information directly through Procorem. All submissions are logged and recorded for easy auditability. With Procorem HFA software, easily manage all the complexities of your affordable housing projects. Assign tasks to multiple parties, manage document and project approvals, organize your project in specific stages and notify all parties when tasks are coming up, past due or are ready to be worked on! Get up and running with Procorem in less than two minutes! The implementation of Procorem has been a complete success. Procorem has reduced team stress, cut down on travel, and allowed us to conduct file inspections in the office. Finally, Procorem will completely cut out the use of paper based products, increasing overall cost savings and helping the environment. What I like about Procorem is when I begin a project that is monitored by a federal agency and we need to share a large volume of sensitive information, it only takes a few minutes to setup a new work center and invite others to participate in a secure environment. Then, once the project is complete, I can delete the work center with a few clicks of the mouse.